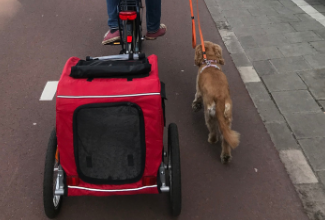 A dog bike trailer (hondenfietskar) is literally a game-changer if you have a dog in Amsterdam that you love to tow along everywhere (like me!). However, as an expat in the city, I had a difficult time finding one that I loved. I wasn’t sure which online stores were the best, and I had some trouble with non-English sites. In case it helps you, here is a list of the best dog bike trailers that I ultimately considered for my dog. Living in Amsterdam, I’ve grown accustomed to riding my bike everywhere. My dog, Clover, being the delight that she is, generally accompanies me on joy rides and weekend explorations. For rides under 20 minutes, it’s simple. I’ll bike as normal with her running beside me on the right. Well-developed bike lanes throughout the country have given me confidence that biking with my dog (fietsen met hond) is safe for my dog and me. However, I had a problem with rides longer than 20 minutes. I live in De Pijp, so many places are just about a maximum of 20 minutes away by bike. However, if I want to take my dog further, say to the huge forest on the edge of the city (Amsterdam Bos), I needed a better solution. My dog could technically handle this 30-minute run back and forth, but we’re going to the forest because we want to run around in there. I don’t want her tired by the time we arrive! Fortunately, in a city dominated by bikes, they didn’t forget about bikes for dogs! This Trixie bike trailer comes in 3 sizes and easily attaches to your bike. It’s the one I ultimately purchased, so I have first-hand experience. As my dog (Clover) is 10kg, I initially ordered a Small trailer. However, when it arrived, we felt it was a little too small for her to move around it, so we swapped it for Medium. Easy returns and exchanges are one key reason why I love ordering from Amazon Germany living in Amsterdam. The trailer comes with one small bike attachment but if both you and a partner want to be able to attach the dog trailer to your bike, you can purchase an extra bike attachment. See how small it is? Barely noticeable so you can keep it on even when you’re not using the dog trailer. The bike is well-built with multiple dog entrances. It also has a combination of zippered plastic covers (in case of rain) and velcro mesh doors (to secure your dog within the bike but still allow in fresh air). It’s a well-thought-out bike that is even convenient for apartments because the wheels come off when not in use and the arm that connects the trailer to the bike can fold underneath the main compartment. The only improvement I would make to this bike would be thicker padding in the interior base of the trailer. The dog bike trailer does come with a padded mat, but it is quite thin. Since there are often bumps on the bike lane, I opted to add an extra dog bed within the trailer. Noting the dimensions of the internal compartment of the hondenfietskar, I found a dog bed similar to this to add some extra padding. The internal compartment of the medium-size has a length x width of 43cm x 73cm so the Medium dog bed measuring 50cm x 70cm would work well. This Globetrotter is a bike trailer and a jogging stroller combined into one package. The jogging function (front wheel and handle) can be removed when not in use, so it does not interfere during your bike ride. ZooPlus is a great website from which to order pet supplies. From my experience, their delivery is super fast. Often when I order my dog’s Wolf of the Wilderness canned food from ZooPlus, it arrives the next day! This bike trailer also has the option is purchasing a second bike attachment for a low price as well. DoggyRide is perhaps the most well-known Dutch dog trailer brand. Living in The Netherlands, if you want to support a Dutch company and buy a classic bike trailer, you might consider this. However, it was a little over my budget so I could not do so personally. This Karlie Flamingo dog bike trailer is the perfect option for you if you want a well-priced dog trailer and you might want to go jogging with your doggie in stroller-tow later. This Karlie Jogger Function is an add-on that you can purchase later if you suddenly develop a fondness for jogging. However, if you already know that you’ll be using the jogging function, the Globetrotter is a better price. During my research, I must have read through every single review of every dog bike that I found. I don’t like to buy many things so when I do buy something, I make sure it’s the best value for my money. Having used it for two years, I’m very happy with the Trixie bike trailer that I mentioned earlier so I would highly recommend it to anyone who is looking for their first dog bike trailer. For the price (and customer service), I don’t think there is a better deal out there. Pro tip: Toss in a couple of your dog’s favorite treats and a nice and healthy dog chew to occupy your dog’s time in the dog bike trailer! Let me know which one you end up getting. I would love to see some photos/videos of you and your dog riding!